Over 400 people joined us for the beautiful 3rd Annual Gala of Hope on Saturday, February 23 at Vie on North Broad Street in Philadelphia. Together, we raised over $58,000 to support the MDA/ALS Center of Hope, education and research initiatives. The evening was truly a success and we are deeply grateful for the generosity of our guests and supporters. Dr. Robert Sinnott, the evening’s guest speaker, shared a very heartfelt message of hope and what it meant to him as a person battling this disease. Most importantly, Bob shared an encouraging message, “To love harder." We are appreciative to Hank Flynn from Fox 29, our Emcee, who not only was an excellent host, but who also put a personal note on the evening in memory of his father-in law. Thank you to all of our sponsors, many of whom have been on-going supporters of the ALS Hope Foundation. Thank you to the many who donated items to the Silent Auction as your generosity truly added to the evening festivities. And of course, a huge Thank You to the staff at Vie who admirably managed a room full of 400 guests with ease and professionalism. The food was delicious, the room was gorgeous, and every one felt welcome and taken care of. The evening brought awareness to the ALS Hope Foundation and the work of the team at the MDA/ALS Center of Hope and recognized their 20 years of dedicated care for people with ALS. View additional photos from the event on our Facebook page or via this link. Watch bob Sinnott's speech and see the Team video below! The 3rd Annual Gala of Hope marked the twentieth anniversary of the ALS Hope Foundation, which I co-founded with my friend and colleague Dr. Jeffrey Deitch, who passed away a few years ago. Dr. Deitch was a gifted scientist and humanitarian whose ideals and commitment will forever be part of the ALS Hope Foundation mission. I want to take this opportunity to acknowledge the challenges faced by people living with ALS and their families every day. No one understands the urgency of our cause more clearly than PALS and their loved ones. The courage and grace with which PALS like our guest speaker at the Gala of Hope, Bob Sinnott, and their families face this disease is an inspiration to all of us at the ALS Hope Foundation and the MDA/ALS Center of Hope. Together, the ALS Hope Foundation, the MDA, and Temple Health, along with our team of clinicians and volunteers, are committed to making a difference to the ALS community. We are proud of our ALS Center which has have made tremendous progress over the last three years at Temple University. Our multidisciplinary team is focused on implementing state of the art care with hope, compassion, and honesty. We are committed to the future, learning more about ALS, its causes, and drugs that may someday allow us to offer better treatment options. We are also dedicated to educating people about this disease - whether it is people living with ALS, healthcare providers, or the general public We want to accelerate research for the good of all people with ALS through our collaborative efforts within Philadelphia and across the United States. This progress is only possible through the joint efforts of the ALS Hope Foundation, Temple, the MDA and you! Despite much progress, there is still work to be done. While we have two medications, Radicava and Riluzole, that can slow the progression of ALS, there is an urgent need to find real and tangible treatment while taking care of people living with ALS now. For this reason, the mission of the ALS Hope Foundation includes care, research, and education. Thank you for joining us in this important mission. Please enjoy your evening, and know that your participation in our organization is vital to keep hope on the horizon. We are thrilled to share this exciting news with you regarding our 3rd Annual Gala of Hope, affiliated with MDA/ALS Center of Hope at Temple University. We sold over 230 tickets in one month! After careful thought, we have decided to move the event to a larger venue to better accommodate our guests. This means we also have to change the date. Please now join us on Saturday, February 23, 2019 at 7pm at Vie 600 N Broad Street in Philadelphia! All tickets previously purchased will be accepted and no further action need be taken. If you are unfortunately unable to attend, please know that you will be missed. A response to this email will enable you to receive a full refund. You can also contact Mara at mara@alshopefoundation.org or 215-568-2426 with any questions or concerns. Thank you for your continued support of the ALS Hope Foundation community. Your donations and assistance make HOPE possible! Looking forward to seeing you on February 23, 2019 at Vie! If you would like to purchase tickets or learn more about our sponsorship and advertising opportunities, visit this page. 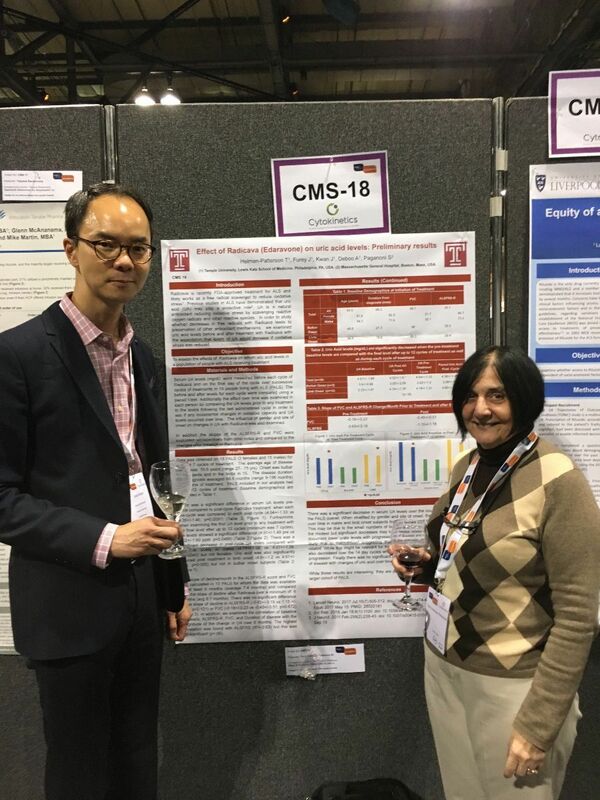 Glasgow, Scotland, UK was the setting for the 29th International Symposium on ALS/MND this December, 2018. This symposium is put on annually by the MND Association of England, Wales and Northern Ireland and is a full week of meetings, presentations and posters. This event attracted over 1300 attendees, including scientists, clinicians, association members and PALS/CALS, from around the world. Terry Heiman-Patterson, MD, Justin Kwan, MD, Donna Harris, MA, CCC, and Sara Feldman, DPT, ATP, spent the week attending the many scientific and clinical sessions and meetings. Each day, the ALS Hope Foundation went on Facebook Live to update our followers on the day’s events and presentations. See our Facebook page https://www.facebook.com/ALSHopeFoundation for the videos! Steve Bell (MNDA), Chairman of the International Alliance of ALS/MND Associations opened the week of meetings December 4, 2018 with the 26th Annual Alliance Meeting. The Alliance brings together ALS/MND organizations from around the globe. The ALS Hope Foundation has been a member of this international group since 2001 and Dr. Sara Feldman is on Board of Directors for the Alliance. The Ask the Experts event is held the second day of the meetings. This year’s panel included Dr. Brian Dickie (MNDA), Professor Dame Pamela Shaw (Sheffield), Professor Orla Hardiman (Ireland) and Dr. Bhuvaneish Selvaraj and Dr. Arpan Mehta (Euan MacDonald Centre). The event was live streamed on social media and the full video and power point slides are available via this link. The Allied Professionals Forum was held on December 6, 2018. This is a day-long session developed for Allied Health Professionals and the ALS Hope Foundation has been a committed supporter for many years. Sara Feldman is co-chair along with Rachel Boothman (MNDA). The presentations will be posted to the Alliance website early in 2019. 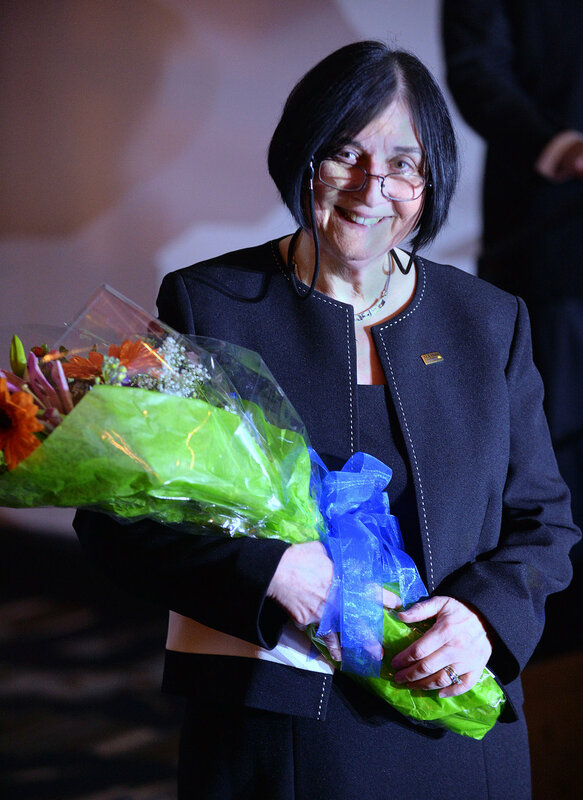 We are pleased to announce that Dr. Feldman received the inaugural Allied Health Professionals Award! The 29th International Symposium on ALS/MND then took place on December 7-9, 2018. Sally Light (MNDA) opened the Symposium and Craig Scott from MND Scotland, this year’s hosts, welcomed everyone in attendance. It was three full days of presentations and posters. Please see the full program. Dr. Heiman-Patterson was on the judging panel for this year’s clinical poster prize. Dr. Heiman-Patterson and Dr. Kwan also presented a poster, “Effect of Radicava (Edaravone) on uric acid levels: Preliminary results.” Sara Feldman and Donna Harris presented a poster on “Modifying Cervical Support to Allow Rotation with a 3-D Printed Attachment.” Carlayne Jackson (UTHSC) gave a platform presentation on “Measuring rate of decline in pulmonary function in ALS: Results from the ALS nutrition/NIPPV study group” with Dr. Heiman-Patterson and Dr. Ossama Khazaal as co-authors. The International Symposium on ALS/MND is the largest medical and scientific conference specific to ALS/MND in the world and brings together everyone, leading researchers, clinicians, PALS/CALS, and associations, who dream and believe that one day there will be a world without ALS/MND. We all leave invigorated with a renewed sense of purpose, inspired with new ideas, and driven with that ever present urgency. For we know that for those living with ALS/MND, time is all too precious and short. Steven Bell, outgoing Chair of the International Alliance of ALS/MND Associations presents Sara Feldman with the Allied Health Professionals Award in Glasgow, Scotland. The 17th Annual Northeast ALS Consortium (NEALS) meeting was held October 2-4, 2018 in Clearwater, Florida. NEALS now has over 100 member sites, including centers in Lebanon, Israel, Mexico, Canada, Australia and Italy, and there were researchers, clinicians and allied health professionals from throughout the country in attendance. Dr. Terry Heiman-Patterson, Dr. Justin Kwan, Dr. Ossama Khazaal, Sara Feldman, PT, DPT, and Kathleen Hatala, RN, represented the MDA/ALS Center of Hope at Temple University. The mission of NEALS is to rapidly translate scientific advances into clinical research and new treatments for people with ALS/MND. To this end, they offer a full day of Outcome Measures and Site Management training. As part of the research team here at Temple, Sara Feldman and Kathleen Hatala attended and assisted with the training sessions and attended multiple study specific and committee meetings. It is an excellent setting to discuss issues and share information! The General Session started the following morning with an update of the past year. Then the presentations started with a Right to Try and Expanded Access discussion lead by James Russell (Lahey) and Jinsy Andrews (Columbia) to inform the audience of the differences and implications. The next session was updates on NEALS trials and included Timothy Miller’s (WashU) update on C9ORF72 Natural History and Biomarkers; Jeremy Shefner (BNI) on ALS Testing Through Home-based Outcome Measures; Brian Waigner (MGH) on the Retigabine study; Shafeeq Ladha (BNI) on the Tocilizumab study; and Jennifer Roggenbuck (OSUMC) on the results of a survey on Genetic Testing Practice at NEALS sites. The afternoon session was dedicated to the Abstract Platform presentations. These included Emily Plowman (UFla) Best Clinical Screening Tools for Early Detection and Accurate Monitoring of Dysphagia in ALS: Development of the Physiologic Risk Index of Swallowing Impairment; Richard Smith (CNS) Computer Assessment of Speech in a Successful ALS Treatment Trial; Jeremy Shefner (BNI) Use of a Time to Event Strength Measure in a Phase 3 ALS Trial; Stephen Goutman (UMich) High Plasma Levels of Organic Pollutants Negatively Impact Survival in ALS; K Kukulka (UMissouri) on Framing a Palliative Approach to ALS: Eliciting Stakeholder Perspectives on the Realities of Living with ALS; Colin Quinn (UPenn) onInteruser Reliability of the Penn UMN Score in ALS; G Sadri-Vakili (MGH) Cromolyn Sodium Treatment is Neuroprotective and Delays Disease Progression in SOD1G93A Mouse Model of ALS; and L Hochberg on BrainGate Pilot Clinical Trials: Harnessing Motor Cortical Signals for the Control of Communication Devices by People with ALS. The poster session followed. The next morning session then moved on the Science Update and was chaired by Robert Brown (UMass), Jeffrey Rothstein (Johns Hopkins) and Timothy Miller (WashU). The presentations then started with Bruce Miller (UCSF) discussing ALS and FTD; Orla Hardiman (Trinity, Dublin) adding her thoughts on Cognitive and Behavioral Changes in ALS; then Christopher Coffey (UIowa) presented an innovative statistical design and analysis. Sara Feldman and Peggy Allred stepped down as the co-chairs of the Physical Therapy Committee which they co-founded in 2012. When the NEALS meeting ends, the Clinical Learning Institute (CRLI) begins. The goal of the CRLI is to educate and empower people with ALS to become “Research Ambassadors.” Dr. Heiman-Patterson is one of the CRLI instructors and is looking to bring it to the Philadelphia region again. Mara Nissley, Communications and Events Manager for ALS Hope Foundation, won the $100 second prize for Mission Story Slam. on May 22 The event was hosted by PWPVideo at Yards Brewery in Philadelphia. The evening was an opportunity for representatives and supporters from various non-profits and triple bottom line companies to tell their story about "that moment". Participants were not allowed to use notes or props and were restricted to telling their story in 5 minutes or less. The 3 judges then determined the first prize, $250 award and the second prize, $100 award. Click the video on the left to view Mara's winning story about her grandfather. We are so grateful to have had this opportunity during ALS Awareness Month to share our story. Well done to all the other participants and to the wonderful individuals and organizations making a difference in the Philadelphia area! In June, Mara was a guest on The Greater Good Project on 1520 WCHE in West Chester to talk about her experience. She was joined by the first prize winner, Karen Singer, the creator of the story slam, Michael Schweisheimer and Greater Good Project host Donna Saul. They had a great conversation about the stories they shared as well as the power of storytelling, especially in the non-profit world. We encourage everyone, even though it might be hard, to share their experiences. Stories help people connect on a personal level and make it easier to spread awareness and promote support. The next Mission Story Slam will be held on September 28th, 2018 at Yards Brewing Company in Philadelphia. You can purchase tickets here and learn more about Mission Story Slam here. The 17th Annual Research Update and Awards Luncheon was held on Sunday, May 6, 2018 at the Philadelphia Marriott West in Conshohocken. We are grateful to our friends at InfuCareRX for their generous sponsorship of this year’s event! This event is an opportunity for everyone to learn more about the current state of ALS research and for us to thank our wonderful supporters from throughout the year. Nearly 160 people attended this year’s event! We are grateful for the amazing level of support our community has shown our organization. Our keynote speaker, Dr. Jeffrey Rosenfeld, presented “Understanding ALS: Sorting Apples and Oranges”. Dr. Rosenfeld has the unique gift of translating complicated science and data into easily understandable language. He suggested that ALS may not be just one disease but in fact a combination of diseases and if this is true, we need to approach finding treatments and a cure in an entirely new way. His presentation can be found on our Youtube channel shortly. Dr. Terry Heiman-Patterson continued the research discussion by discussing the basic research occurring at the Neurosciences Lab at Temple Health. She is starting an exciting new collaborative project that will involve researchers from around the country. Enrollment is also open for several clinical trials for new treatments and therapies for ALS at the MDA/ALS Center of Hope. The awards portion of the day is our way of personally thanking our supporters. Todd Kelly, who has been greatly involved with our organization over the past few years, was the recipient of the Sunrise Award. His incredibly poignant speech at our 2nd Annual Gala of Hope moved us all to tears. He has participated in our Hope Educates program, told his story for our Season of Hope, and shows up at many different events! We are truly grateful for his dedication and commitment. The Courageous Heart Award is given to those who have taken a proactive role in the fight against ALS, supporting both people living with ALS and the ALS Hope Foundation, while courageously battling ALS themselves. Our awardees this year were Steven Anoia, Jack Buzby, Joy Carducci, Ross Doughty, Tom Rodgers, John Sweeney, Patricia Vitkow and Brian Zubatch. Mr. Sweeney asked that his wife, Jennifer, receive his award instead and David Buzby received the PopPop’s best helper award. Our Community Heart Award was presented to Avanir Pharmaceuticals, Greenstar Exteriors, PatientsLikeMe and Stuart Wallet, DDS & Karen Wallet, DMD. Each of these community partners have shown outstanding support of our organization over the past year. Their partnership enables us to strengthen ties to the community as well as grow our programs and services. The Promise of Hope Award is presented to young people who are making a change in their community through advocacy for people with ALS. This year’s recipients were Maria Lombardi, who participated in our Hope Educates program to learn more about ALS for her school project, and Dana Sweeney, who designed a fully functional ALS research facility, clinic and office space for her Capstone Senior Design project at a Philadelphia University. These young ladies have shown a level of maturity and understanding well beyond their years. They will undoubtingly continue to be change makers and make a lasting impact on the ALS community. Thank you so much to everyone who came out as well as all the people who work with us to continue the care and search for the cure of people with ALS. Photos from the event can be viewed here.